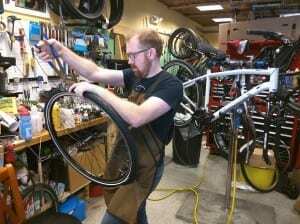 Vermont Bicycle Shop owner Darren Ohl works on repairing a tire for a customer. Vermont Bicycle Shop will be celebrating its one-year anniversary this weekend. Vermont Bicycle Shop in Barre will celebrate its one-year anniversary with a weekend sale on April 1-2, complete with door prizes, sale prices on nearly everything in the store and mini cupcakes! Proprietor Darren Ohl said he’s looking forward to thanking everyone for their support over the past year. Ohl is also being noticed nationally. He was recognized by the Professional Bicycle Mechanics Association (PBMA) as Mechanic of the Week for his continued support to his community, long standing experience, and professional service. Ohl is an internationally licensed UCI bicycle mechanic and Vermont’s only PBMA mechanic. He’s doing a fine job representing the Granite City.